A well-designed business card expertly printed on handsome stock used to be a statement, a reflection of the holder’s identity that indicated a sense of pride. These days, most business cards are designed on cheap graphics software from a template and hastily spit out on ink-jet printers on pre-cut paper. Run your finger across them—the ink will smudge and the edge will reveal perforations. Even small-press printers, the mom-and-pop shops and franchises who once took pride in their work are now mostly turning out mediocre printing. The last business card I had made came back with the print off center and was cut so poorly most were unusable. At least to me. So when I heard about Chattanooga’s Print Cooperative and its mission to revive small-press artisan printing, I found reason to rejoice. But this is about more than business cards. It’s about the craft and trade of artisan printing, the sort you experience when you hold a lovingly typeset chapbook printed on fine textured paper. It’s about the graphic design seen on the classic concert posters designed and printed by Nashville’s famed Hatch Show Print, which is now part of the Country Music Hall of Fame and Museum. But mostly it’s about the revival an artform of a bygone era. And quality. Paul Rustand and Matt Greenwell, two Chattanooga graphic designers with a passion for quality printing—including the antiquated art of letterpress—are attempting a revival of letterpress printing with their new co-op, an enterprise born of a MakeWork grant that will open this spring and offer classes in printmaking led by Juanita Tumelaire and also offer quality, small-batch letterpress printing by Terry Chouinard. Rustand, creative director of Widgets & Stone, a Chattanooga design agency, and Greenwell, head of UTC’s Art Department and a collaborator with Rustand at Widgets & Stone, applied for the MakeWork grant this summer. Rustand owned an aging letterpress he had used for years, he said, and Greenwell had access to UTC’s collection of printmaking equipment collecting dust in storage. The collection of equipment—which also includes offset litho presses, etching presses and a growing selection of wood and metal type—are coming back to life and will be housed in Rustand’s former studio in a small warehouse behind Market Street facing the Urban Stack restaurant and bar. Joining the design duo are Tumelaire, a local printmaker and book artist, and Chouinard, a printer and proprietor of Ithaca Type in Athens, Ala., who is relocating to Chattanooga to join the team. That process has two parts. The two hope to share their passion for letterpress and custom small-batch printing with other artists, designers and students who can take printmaking classes created and led by Tumelaire. The business side will be the domain of Chouinard, a talented, dedicated craftsman with an abiding affection for the letterpress. Chouinard’s equipment and expertise will be key to the co-op, offering designers and artists a unique method of printing that, ironically, many take great pains to replicate with digital type. 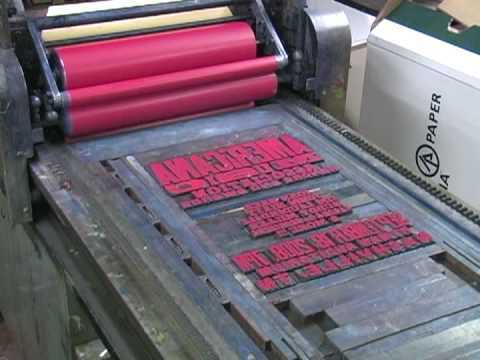 Letterpress is relief printing in which the type and design are locked into the bed of a press, ink is applied and it is rolled or pressed onto paper. Invented by Johannes Gutenberg in the mid-15th century, letterpress work is crisper than other modern forms of printing because of its impression into the paper, giving greater visual definition to the type and artwork. By early spring, Rustand said he hopes to have a curriculum in place for classes and workshops, which will be offered to small groups of students. He’s also hoping to partner with the local chapter of the American Institute of Graphic Arts to collaborate on activities and events, as well as attracting guest lecturers and speakers. Rustand and Greenwell have already organized an enthusiastic group of dedicated supporters from the local design and creative community and update their progress on a Facebook group page, where 100 fans so far are offering help and pledging support for the operation. Chattanooga’s Print Cooperative is located at 1271-B Market St. (facing the Urban Stack restaurant). From the Smithsonian traveling exhibition "American Letterpress: The Art of Hatch Show Print," this video explores art of letterpress printing as practiced by the 125-year-old Nashville press.